Despite the name, right-to-work laws do not confer any sort of right to a job. Rather, they dilute union bargaining strength by making it harder for unions to sustain themselves financially. Some supporters of RTW laws falsely claim that these laws ensure that no one is forced to be a member of a union or pay to advocate political causes they do not support. But those things are already illegal under federal law. What RTW laws do is make it illegal for a group of unionized workers to negotiate a contract that requires each employee who enjoys the benefit of the contract to pay his or her share of the costs of negotiating and overseeing it. In other words, RTW laws prevent unions from requiring that workers who benefit from union representation pay their fair share of that representation. By making it harder for unions to collect these “fair share fees,” RTW laws aim to restrict union resources and to thereby impede unions’ ability to negotiate better wages, benefits, and working conditions for workers. Only 5.2 percent of private-sector workers in RTW states are union members or are covered by a union contract, compared with 10.2 percent in non-RTW states. Based on the impact of an RTW law in neighboring Oklahoma, we could expect that nearly 60,000 fewer Missourians working in the private sector would be covered by a union contract if RTW were implemented in Missouri. RTW laws have not succeeded in boosting employment in states that have adopted them. In fact, RTW laws have no causal impact on job growth or unemployment, contrary to the claims of its proponents. RTW laws are associated with lower wages and benefits for both union and nonunion workers. In RTW states, the average worker makes 3.1 percent less in hourly wages than the average worker with similar characteristics in non-RTW states. This pattern of lower wages in RTW states is also true for women workers and workers of color. Through weakening unions, RTW laws hurt the middle class. 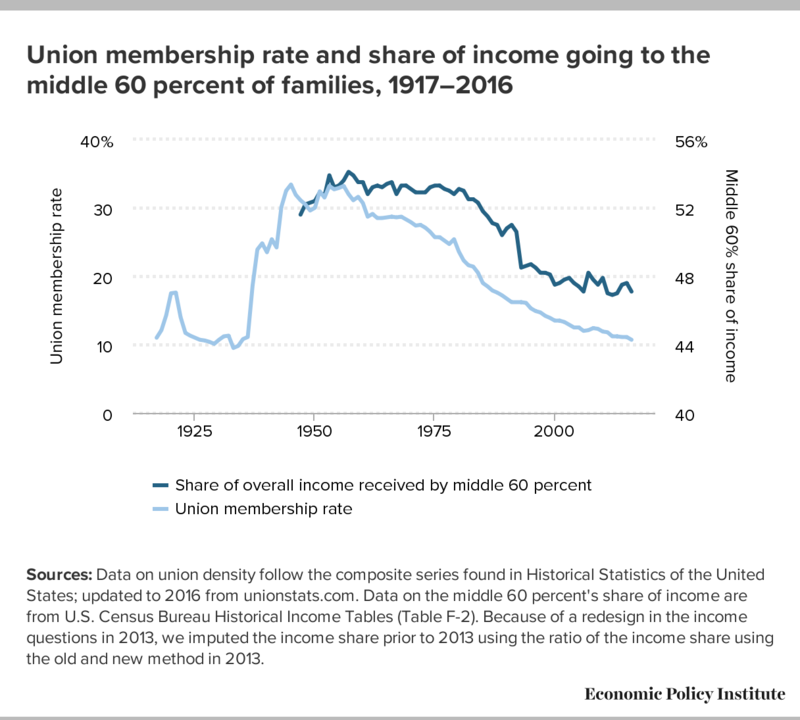 As union membership has declined in recent decades, the share of overall income received by the middle class is close to a post-WWII low. By restricting the capacity of unions to bargain for workers and thus lowering wages and benefits, RTW laws lower tax revenues and reduce aggregate demand. Those considering whether to vote for Missouri’s RTW law should consider the consequences—specifically the negative impact on unionization and wages—while giving the proper zero weight to the false claims that RTW laws would boost the state’s economy and attract new businesses. What is the goal of RTW legislation? Corporate lobbies advocate for RTW laws not to create jobs or give workers more freedom, but to restrict unionization and make it harder for workers to have an effective voice in negotiating with their employers.4 Under federal law, unions are required to represent every employee covered by a union contract. In RTW states, this in practice means providing expensive benefits to many workers who have not paid their fair share.5 Nonmembers in a collective bargaining unit get all the benefits of collective bargaining agreements, including the higher wages and benefits that unions secure through the bargaining process. And if a non-dues-paying employee has a problem at work, the union is required to represent her—including providing an attorney at no charge if one is needed—in exactly the same way it would represent a dues-paying member. Providing the same range of benefits to dues-paying members and nonmembers who don’t pay fees starves the union and diminishes the ability of unions to negotiate higher wages and benefits for workers. There are many organizations that, like unions, require membership dues. For instance, an attorney who wants to appear in court must be a dues-paying member of the bar association. Someone may dislike the bar association, but that person must still pay dues if he or she wants to appear in court. Unions in RTW states are the only organizations in the country that are forced to provide all benefits for free to people who opt not to pay for them. This is because unions in RTW states are banned from requiring those who enjoy the benefits of the union to pay their fair share of the costs of providing those benefits. It is important to note that while this difference certainly reflects the impact of RTW laws, it may also reflect the effect of unobservable factors that are correlated with both RTW and unionization at the state level, such as other anti-union policies or practices. However, rigorous research on the impact of RTW in neighboring Oklahoma finds that the causal impact of RTW in Oklahoma was a 30.6 percent reduction in private-sector unionization.7 In Missouri, the private-sector union coverage rate in 2017 was 8.2 percent. Based on the findings from Oklahoma, we could expect that if RTW were implemented in Missouri, the private-sector union coverage rate in the state would fall to 5.7 percent over time. This would mean that nearly 60,000 fewer Missourians would benefit from being covered by a union contract compared with what we see today. What might be the expected effect on employment if Missouri’s RTW law were implemented? For additional insights, we can turn to a rigorous assessment of the impact of RTW on employment in neighboring Oklahoma. The study found that the passage of an RTW law in Oklahoma had no causal effect on Oklahoma’s overall employment rate or on employment in manufacturing. But more than 15 years after Oklahoma adopted RTW, none of the promises made by its supporters have come to pass. If Missourians were to approve an RTW law for their state, they could expect similar results. Unemployment is another key indicator of labor market health. For the past several decades, Missouri’s unemployment rate has largely tracked that of the nation as a whole, rising when national unemployment increased and falling when it declined. But how does Missouri’s unemployment rate compare with its RTW neighbors? 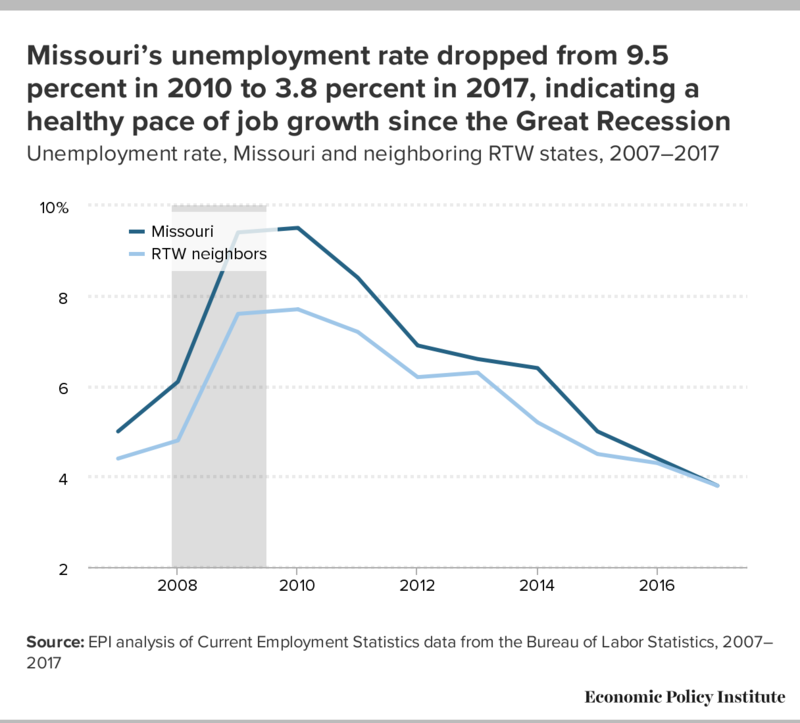 As shown in Figure A, Missouri topped out at a higher unemployment peak during the Great Recession than did its RTW neighbors, 9.5 percent in 2010 compared with 7.7 percent. However, Missouri has experienced a stronger recovery and by 2017, Missouri had the same level of unemployment as its neighbors—3.8 percent. Without RTW laws, Missouri was able to bring its unemployment rate down 5.7 percentage points since unemployment peaked in 2010. If states with right-to-work laws can experience either economic growth or retraction, and if both RTW and non-RTW states can foster booming job markets, then it is clear that something else in these states’ economies, demographics, or policies must be driving job growth, while right-to-work laws account for little if anything in these trends. And in fact, the broader policy agenda often associated with RTW has been shown to be detrimental to state outcomes. When Minnesota and Wisconsin implemented vastly different policies—the former based on strengthening labor standards and other progressive priorities and the latter centered on right-to-work and other measures weakening workers’ rights—the results were clear. Non-RTW Minnesota had stronger job growth, faster wage growth, faster-shrinking gender pay gaps, and greater poverty reduction than its right-to work neighbor.15 The sum of all these metrics leads to a very clear conclusion—outcomes for workers and families have been markedly better in Minnesota, the state that did not follow a right-to work policy agenda. As shown earlier, there is no clear body of evidence that right-to-work laws, in and of themselves, currently have a significant impact on employment growth. But it is worth noting that if they ever did, there is good reason to believe that any such impact would have been eroded by time. In one part, this is the simple logic of competition. To the extent that right-to-work is a draw for manufacturers, its effect would be greatest on the first state to adopt such a statute. If 49 states protected union security and only one had a right-to-work law, employers to whom this policy mattered would all be drawn to that location. The prospect of becoming the latest right-to-work state in the country is much different. Now any competitive advantage a state might realize would have to be sufficiently powerful enough to draw footloose employers to that state not only over the non-RTW states but also over the other RTW states with identical labor laws. In addition, to the extent that RTW laws helped draw northern unionized manufacturing firms into lower-wage and less-organized jurisdictions in the South, this dynamic has long since played itself out. Any measure of comparative job growth over the past several decades captures the deindustrialization of the Northeast and upper Midwest and the mass relocation of firms to the South starting in the 1960s, whether in search of cheaper wages, cheaper land, warmer climates, or less regulation. That wave of relocation may show up in the long-term employment growth of Southern states, but at this point the relocation is complete. How exactly do RTW laws hurt workers who aren’t in unions? When RTW laws weaken unions and lead to lower union wages and benefits, nonunion employers no longer have to compete with higher-wage employers in order to get the best workers, so there is a negative spillover effect in which they lower their own wages and benefits. Conversely, in places where unions are strong, they set standards for entire industries and occupations. As an economic sector becomes more unionized, nonunion employers pay more to retain qualified workers and norms of higher pay and better conditions become standard. To provide a sense of the scope of this effect, a 2016 study looked at what happened to wages when private-sector union density in the United States dropped from 1979 to 2013. Had union density remained at its 1979 level, weekly wages of nonunion men in the private sector would have been 5 percent higher (that’s an additional $2,704 in earnings for year-round workers) in 2013. And wages for nonunion men in the private sector without a college education would have been 8 percent, or $3,016 per year, higher.21 RTW laws, by reducing unionization, hurt the earnings of all workers, not just workers in unions. 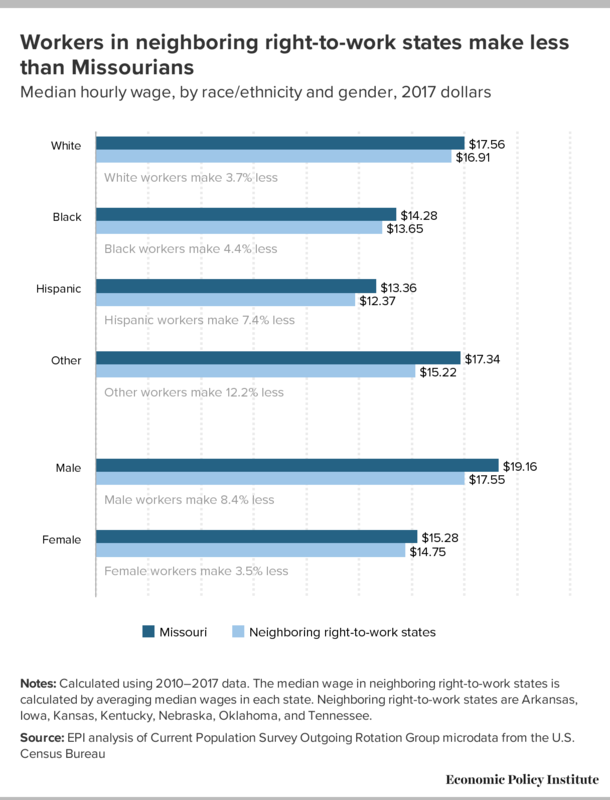 EPI research has shown that women and workers of color in non-RTW Missouri have higher wages than their counterparts in neighboring RTW states.22 Figure B shows the median inflation-adjusted hourly wage of workers in Missouri compared with the median hourly wage of workers in neighboring RTW states by race, ethnicity, and gender. Female workers in Missouri typically make $15.28 an hour, while the typical female worker in Missouri’s neighboring RTW states (Arkansas, Iowa, Kansas, Kentucky, Nebraska, Oklahoma, and Tennessee) makes an hourly wage of $14.75, 3.5 percent less than the typical female Missourian. Notes: Calculated using 2010–2017 data. The median wage in neighboring right-to-work states is calculated by averaging median wages in each state. Neighboring right-to-work states are Arkansas, Iowa, Kansas, Kentucky, Nebraska, Oklahoma, and Tennessee. Unions are a critical part of a system of strong labor standards that makes it possible for regular working people to earn a decent living. Figure C shows that when unions are strong, the middle class is strong, but when union coverage shrinks—as it has in part because of RTW laws and other antiunion policies—a much smaller share of national income goes to the middle class. When the middle class gets a smaller share of income, the households at the top of the income distribution get more, and inequality rises. Sources: Data on union density follow the composite series found in Historical Statistics of the United States; updated to 2016 from unionstats.com. Data on the middle 60 percent's share of income are from U.S. Census Bureau Historical Income Tables (Table F-2). Because of a redesign in the income questions in 2013, we imputed the income share prior to 2013 using the ratio of the income share using the old and new method in 2013. Another way to see how big a force for equality unions are is by looking at how much their decline has contributed to inequality between middle- and high-wage workers. Union decline can explain one-third of the rise in wage inequality among men and one-fifth of the rise in wage inequality among women from 1973 to 2007.24 Should Missouri voters approve the RTW law, to the extent that RTW succeeds in reducing unionization in Missouri, inequality will rise and the middle class will suffer. Economists have long recognized that state and local spending on public services, particularly education and infrastructure, are important components of an economic development strategy.25 These services, however, are put at risk when states adopt a development strategy based on attracting low-wage nonunion employers, which lowers revenues. Union membership has been shown to yield a positive fiscal impact by raising workers’ incomes, reducing the use of public benefits, and increasing the amount of taxes paid. At every level of government—federal, state, and local—union members pay more in taxes than similar nonunion members because they earn more.26 To the extent that right-to-work laws succeed in weakening unions and thus lowering wages and benefits, they also lower tax revenues for local and state government, forcing concomitant cuts in public services. A right-to-work strategy of economic development that aims to attract lower-wage manufacturers whose location is mobile also threatens growth. That is because the greatest growth opportunities in most state’s economies are increasingly concentrated in construction and service industries that are rooted in local communities and dependent on local demand. If states deploy right-to-work laws that undermine wage standards in manufacturing and other industries, there is a danger that they will inadvertently hamstring job growth by restricting aggregate demand in their local economies.27 Most workers spend a large share of their earnings on rent, food, clothing, and other family needs in local retail and services industries. Thus, a drop in their wages translates into a loss of local economic activity. If not RTW, what is the right choice for Missouri? In Missouri and in the United States as a whole, the rising tide of a strong economy once lifted most boats. But today, it’s more likely to lift only the yachts. The broken link between a strong economy and the well-being of most workers threatens the core Missouri value that hard work should pay enough to support a family. To create a more fair, prosperous, and sustainable Missouri, policymakers should be looking to policies that will strengthen—not gut—good jobs. Missouri needs workplace policies that respect and value workers and boost middle-class incomes—growing the consumer spending power that fuels the economy. These policies include increasing the value of the minimum wage, increasing the threshold below which workers cannot be denied overtime pay, providing access to affordable child care, and mandating paid leave and fair scheduling so that workers are able to care for themselves and their families. Missouri should also ensure that workers have a pathway to prosperity by enforcing nondiscrimination laws, providing protections from wage theft and other abuses, and protecting workers who exercise their right to form a union at their workplace. Finally, Missouri can also help create good jobs and raise wages by investing in education and workforce readiness, and by making investments in Missouri’s infrastructure. By investing in education and workforce readiness, the state can ensure that today’s children will be ready for the future and that current workers can transition into new occupations if they need to. And by investing in infrastructure, expanding transportation, extending broadband access, and investing in water and electric utilities that benefit rural and urban areas alike, Missouri will create good jobs that feed local economies. Finally, Missouri should reform its tax structure so everyone pays their fair share. In these ways—not through right-to-work—Missouri can create an economy that sustains its communities and works for everyone by investing in its people and supporting them in the workplace. 1. Thomson Reuters maintains a web page that lists states with RTW laws. See “Right to Work Laws by State,” Thompson Reuters FindLaw, n.d.
2. “Missouri Proposition A, Right to Work Referendum (2018),” Ballotpedia, accessed June 2018. 3. See Mary Bottari, “Who Is behind the National Right to Work Committee and Its Anti-Union Crusade?” Huffpost, August 5, 2014; and Gordon Lafer, Working Hard to Make Indiana Look Bad: The Tortured, Uphill Case for ‘Right-to-Work,’ Economic Policy Institute, January 2012. 4. See Gordon Lafer, The One Percent Solution: How Corporations Are Remaking America One State at a Time (Ithaca, N.Y.: Cornell Univ. Press, 2017); and Nancy MacLean, Democracy in Chains: The Deep History of the Radical Right’s Stealth Plan for America (New York: Penguin Random House, 2018). 5. While RTW laws do not prohibit workers from paying fair share fees, they prohibit requiring workers to pay such fees. In practice, this means many workers accept the benefits of union contract coverage but opt to not pay. And when current union members see their colleagues enjoying the benefits of the union for free, they may decide to opt out as well. 6. To determine unionization differences between RTW and non-RTW states, we use ordinary least squares to estimate a union coverage equation using Current Population Survey Outgoing Rotation Group (CPS-ORG) data from 2017, restricting the sample to wage and salary earners ages 18–64 in the private sector. We regress a dummy variable for being covered by a union contract on dummies for being in a right-to-work state, major industry, major occupation, level of education, gender, race, ethnicity, and foreign-born status, along with age and age-squared. The value given is the coefficient on the right-to-work dummy. 7. Ozkan Eren and Serkan Ozbeklik. “What Do Right-to-Work Laws Do? Evidence from a Synthetic Control Method Analysis,” Journal of Policy Analysis and Management 35, no. 1 (July 2015), https://doi.org/10.1002/pam.21861. 8. Bureau of Labor Statistics, Current Population Survey (BLS-CPS), 2017. Public data series aggregated from basic monthly CPS microdata and accessed through the Labor Force Statistics database and series reports. Accessed June 2018. 9. W. Robert Reed, Does Right to Work Boost Economic Development?, Oklahoma Council of Public Affairs, February 2001. 10. The more scholars are able to hold “all other things” equal, the more it becomes clear that RTW laws have little or no positive impact on a state’s job growth. The most recent and most methodologically rigorous studies conclude that the policy has no statistically significant impact whatsoever. See Gordon Lafer and Sylvia Allegretto, Does ‘Right-to-Work’ Create Jobs? Answers from Oklahoma, Economic Policy Institute, February 2011. 11. See Ozkan Eren and Serkan Ozbeklik, “What Do Right-to-Work Laws Do? Evidence from a Synthetic Control Method Analysis” [author-posted version of article published in Journal of Policy Analysis and Management 35, no. 1 (July 2015): 173–194]. After a literature review, the authors conclude, “Some studies find significant effects of RTW laws on various state outcomes, while others find no effect (see for example, Hirsch 1980, Holmes 1998, Farber 2005, Lafer and Allegretto 2011).” The authors did their own study of the implementation of right-to-work in Oklahoma and found no effect on employment. See also Frank Manzo IV and Robert Bruno, The Impact of ‘Right-to-Work’ Laws on Labor Market Outcomes in Three Midwest States: Evidence from Indiana, Michigan, and Wisconsin (2010–2016), School of Labor & Employment Relations at the University of Illinois at Urbana-Champaign, April 2017. It is worth noting that the finding of no causal impact of RTW on employment in rigorous studies typically refers to laws passed since 2000. 12. W. Robert Reed, Does Right to Work Boost Economic Development?, Oklahoma Council of Public Affairs, February 2001; and Bill May, “Proponents Foretell Benefits of Right to Work,” Journal Record, September 19, 2001. 13. Celeste Bott, “Right to Work: Here’s What You Need to Know,” St, Louis Dispatch, February 2, 2017. 14. Christopher Brown, “Timing of Missouri Right-to-Work Vote up in the Air,” Bloomberg, May 2, 2018. 15. David Cooper, As Wisconsin’s and Minnesota’s Lawmakers Took Divergent Paths, So Did Their Economies, Economic Policy Institute, May 2018. 16. Robert J. Newman, Growth in the American South (New York: New York Univ. Press, 1984). 17. Benjamin Austin, Edward Glaeser, and Lawrence Summers, “Saving the Heartland: Place-Based Policies in 21st Century America,” Brookings Papers on Economic Activity, March 2018. 18. Josh Bivens et al., How Today’s Unions Help Working People: Giving Workers the Power to Improve Their Jobs and Unrig the Economy, Economic Policy Institute, August 2017. 19. Elise Gould and Will Kimball, “Right-to-Work” States Still Have Lower Wages, Economic Policy Institute, April 2015. 20. Heidi Shierholz and Elise Gould, The Compensation Penalty of “Right-to-Work” Laws, Economic Policy Institute, February 2011. 21. Jake Rosenfeld, Patrick Denice, and Jennifer Laird, Union Decline Lowers Wages of Nonunion Workers: The Overlooked Reason Why Wages Are Stuck and Inequality Is Growing, Economic Policy Institute, August 2016. 22. Valerie Wilson and Julia Wolfe, Black Workers in Right-to-Work (RTW) States Tend to Have Lower Wages Than in Missouri and Other Non-RTW States, Economic Policy Institute, May 2018. 23. Valerie Wilson and Julia Wolfe, Black Workers in Right-to-Work (RTW) States Tend to Have Lower Wages Than in Missouri and Other Non-RTW States, Economic Policy Institute, May 2018. 24. Bruce Western and Jake Rosenfeld, “Unions, Norms, and the Rise in U.S. Wage Inequality,” American Sociological Review 76 (2011): 513–537. 25. See, for example, Ronald Fisher, “The Effect of State and Local Public Services on Economic Development,” New England Economic Review, Federal Reserve Bank of Boston, March/April 1997; Timothy J. Bartik, Growing State Economies: How Taxes and Public Services Affect Private Sector Performance (Washington, D.C.: Economic Policy Institute, 1996); and Robert G. Lynch, “The Effectiveness of State and Local Tax Cuts and Incentives: A Review of the Literature,” State Tax Notes, September 1996. 26. Aaron Sojourner and José Pacas, “The Relationship between Union Membership and Net Fiscal Impact,” IZA Discussion Paper no. 11310, https://ssrn.com/abstract=3117314. 27. Belman et al. find that higher wage rates have a significant positive impact on a state’s overall economic activity, which the authors suggest reflects increased aggregate demand. See Dale Belman, Richard Block, and Karen Roberts, “Economic Impact of State Differences in Labor Standards in the United States, 1998–2000,” Employment Policy Research Network blog, January 2011.